KATY, Texas, Feb. 13, 2019 /PRNewswire/ -- Midstream industry veteran I.J. 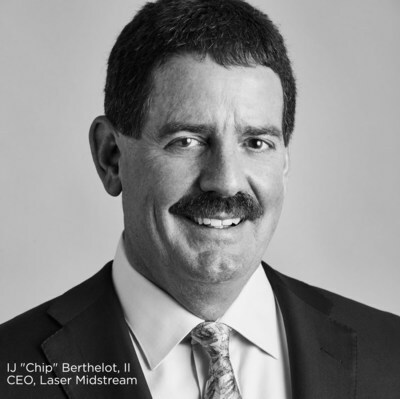 "Chip" Berthelot, II today announced the launch of Laser Midstream Energy ("Laser"), his fourth private equity-backed midstream venture in two decades. The new company is being financed by an equity commitment from Energy Spectrum Capital ("Energy Spectrum") and management. Laser will seek to acquire, build and expand natural gas, oil and water transportation and processing assets to dramatically increase efficiency in North America's oil and gas sector, focusing on multiple basins for opportunities. "We believe Laser's battle-tested, customer-focused, relationship driven, and creative management team understands how to maximize resources to develop, own and operate this energy infrastructure with maximum efficiency, while focusing on growth and safety," said Berthelot. "Energy Spectrum is extremely pleased to sponsor Chip for the fourth time. He is an excellent leader and is surrounded by a top-quality team of experienced midstream professionals, all of whom have proven to have the respect and confidence of the producer community. We are confident that Laser will have great success," commented Tom Whitener, President of Energy Spectrum. Mandy Bush, Chief Financial Officer, a certified public accountant with more than 16 years of experience in energy finance including IPOs and complex transactions. John Loiacono, Vice President, Commercial & Business Development, a highly accomplished energy professional with more than 30 years of progressive industry background. He is the primary point of contact for new Laser business interests. Kipper Overstreet, Vice President, Corporate Development, a West Point graduate and energy industry professional with two decades of experience in operations, engineering management, M&A, forecasting, strategic finance, and sales management. David Garrett, Vice President, Commercial & Business Development, an energy industry veteran with more than 36 years of experience in midstream and related sectors. Victor Davis, Vice President, Operations, an energy industry professional with over 22 years of experience in operations, project management, and asset optimization. James "Jay" Carter, Vice President, Gas Supply, an energy industry professional with 11 years of experience in construction and engineering projects as well as operations, commercial, and business development. "Our goal is to build another company focused on buying & expanding large-scale gathering & processing assets and developing greenfield/brownfield projects as well. We are serious about contributing to our country's growing need for infrastructure that connects the surplus energy produced by our customers to the markets consuming their products," Berthelot said. Acquiring, owning and operating high-performance natural gas and crude oil gathering and transmission systems. Providing gas treating and processing facilities. Developing greenfield and brownfield projects. Enhancing operations with advanced technology and management systems. "We offer extensive expertise across the board. Whether it's closing acquisitions and combining assets to harness synergies, expanding existing footprints, or starting infrastructure projects from scratch, our laser focus delivers peerless value for customers and stakeholders," said Berthelot. Berthelot, who began designing and building midstream facilities in the 1980s, founded the first iteration of Laser Midstream in 2005. That firm focused on natural gas gathering and processing in Texas and Louisiana. He subsequently formed Laser Northeast, the first gathering system to traverse Pennsylvania and New York State in the Marcellus Shale region. In 2013, he led a team to create a new venture, Azure Midstream Energy. Laser has opened the doors to its new headquarters at 23501 Cinco Ranch Blvd., Suite G250 Katy, TX, 77494. For the latest information on the company check out the website at www.LASER3.com.